The company has carved a niche for itself as a Manufacturer and Supplier of Earthing Electrodes in the Hoshiarpur. Marketed under the brand name EARTH SURE EARTHING ELECTRODES, these Earthing Electrodes are widely popular among the clients. The most important aspect in electrical industry is to provide the effective earthing and these Earthing Electrodes are capable to eliminate electrostatic discharge to save the sensitive equipments and to avoid disturbance in power supply. The Earthing Electrodes are known for providing highly efficient earthing that ensures the safety of human life as well. The Earthing Electrodes are available with customized designs having the company logo. The Earthing Electrodes it can be obtained in both G.I and Copper with durable packaging. Hot dipped galvanized strip in G.I. 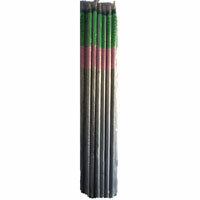 Pipe is used as primary electrode and it helps in smooth flow of current. G.I. Pipe is secondary electrode and filled with a special compound which has conductive and non-corrosive elements which helps longer life of electrode. G.I. Strip which ensures effective earthing is provided with earthing terminals directly. The Earthing Electrode have benefits of both strip and pipe earthing. Public places, hospitals, schools, multiplexes, malls etc. Chemical surrounding the electrode has hygroscopic and conductive qualities. Chemical absorbs and retains moisture contents for a longer period. Select clayey or highly humid soil to install the Earth Sure Electrode. Dig a hole of 6"-8" diameter upto 2 or 3 metres deep depending on the length of the electrode. Place the Earth Sure Electrode in the centre keeping the terminal on the top. Fill the surrounding area of Earth Sure Electrod with Earth Sure Backfill compound mixing with sufficient quantity of water. For normal conditions 1 bag of backfill compound with 2 mtrs earthing and 2 bags of backfill compound with 3 mtrs earthing is recommended. Connect the earth wire of the system or equipment to the terminal of the electrode. Cover the earth terminal with some lid. Do proper watering for a few days. Please remove the packaging from the electrode before installation. No specific attention paid to the dimensions and quality of G.I pipe used. 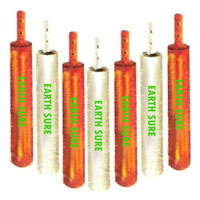 Earth Sure Electrode employs the use of hot dipped G.I pipe both from inside and outside. The benefit is of singular nature i.e either pipe earthing or strip earthing. It has the benefits of both pipe and strip earthing. The use of salt and charcoal has adverse effects on the pipe as it corrodes the pipe. Our method employs the usage of special backfill compound that is more efficient than the salt-charcoal mixture and non corrosive. In adverse weather conditions there is a need to maintain the low resistivity value by adding water from time to time. The backfill compound used by us has hygroscopic properties which retains the moisture for a long time, thereby reducing the need of adding water externally. Has poor performance when It comes to the elimination of static charges. The dual nature of our earthing ensures the elimination of these static charges. This method needs timely replacements to ensure the constant effectiveness of the earthing. Our method is long lasting and trouble free without any compromise whatsoever in the efficiency of earthing.